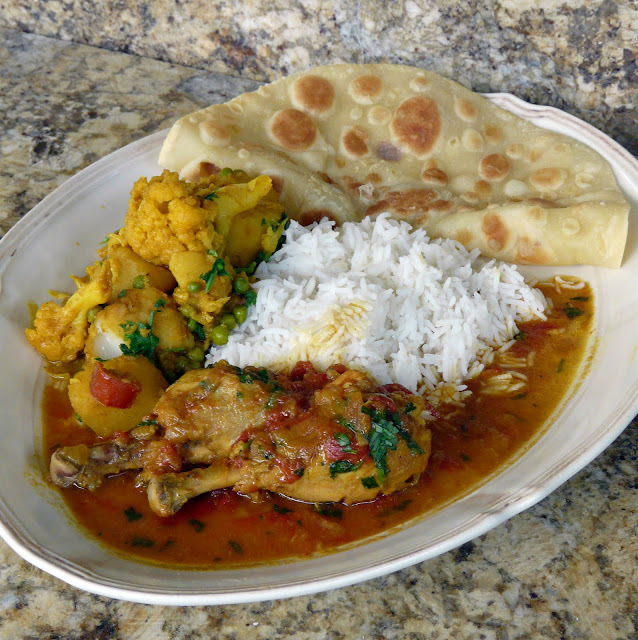 I love Indian curry. So does Moe. 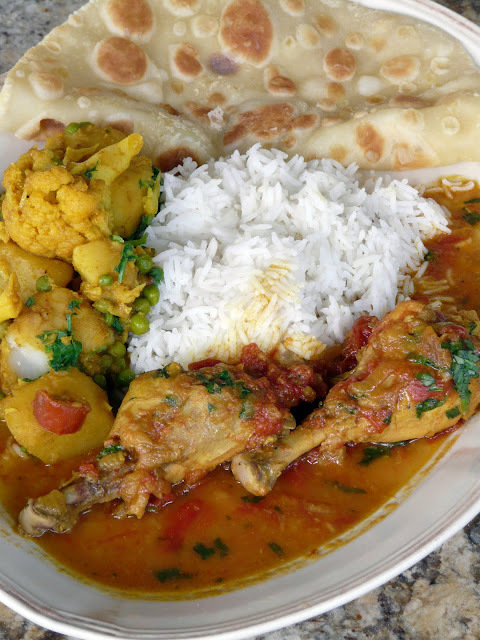 But when I want a curry dinner I want more than one dish. Yesterday was a work day for me so no time to make three or four dishes. But time to make a couple. I put the chicken curry on to cook in the morning so that it was finished before I left for work. 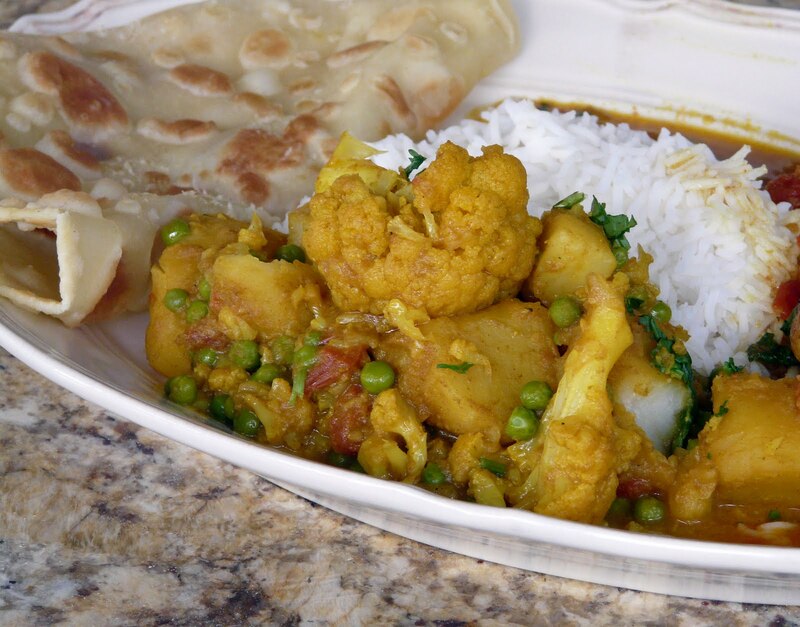 One of my favourite sides to serve with chicken or beef curry is Aloo Gobi - a potato cauliflower curry dish. This dish doesn't take long to make so I put it on to cook after I got home. Naan is my preferred bread to serve with Indian curry, but to really make Naan and get that authentic Naan flavour you need a Tandoori oven. 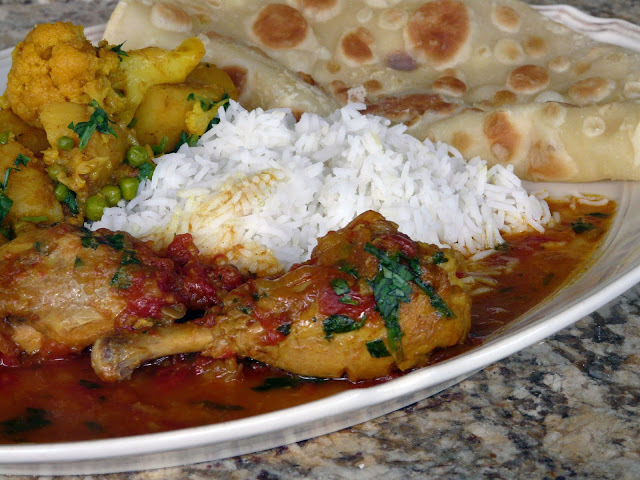 So I usually make Chapati. This time though I tried another new flatbread recipe. One of Julie Goodwin's recipes. So easy to make and absolutely delicious. Both the chicken curry and the Aloo Gobi recipes are from my favourite Indian Cookbook - Classic Indian Cooking - by Julie Sahni. This meal looks very flavourful with complex layers. This all sounds so delicious! I've only made gobi aloo once, so it's about time I tried it again. Looks simply delicious!! I cannot wait to try it. MMMMMMMMmmmmmmmmmmmmmmmmmm....thats all I can say! Gobi Aloo looks delicious. It all looks fantastic. Oh my, this makes me hungry. 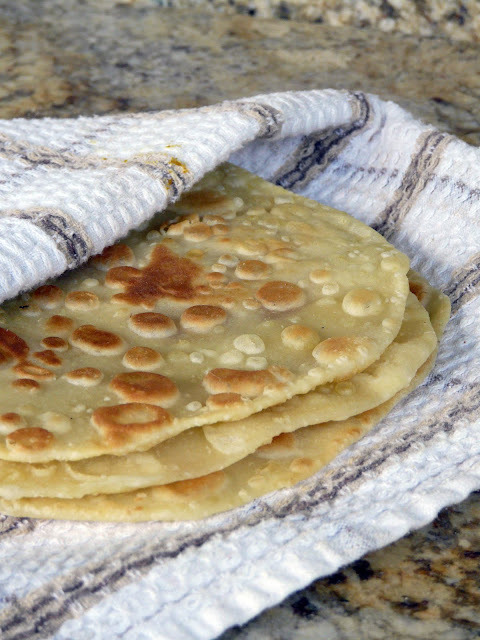 I love the recipe for the flatbread made without yeast instead of Naan bread. I'm anxious to try it. This is dinner sometime this week!